If I had to eat one style of food for the rest of my life it would be a toss up between Italian and Asian. I love rice and noodles. I love soups. We love the flavors of soy sauce, fish sauce, hoison sauce, spicy, sweet and salty. These are the flavors that I find when we cook asian meals. I always feel good after eating a meal like these because they are not heavy and usually have a ton of veggies. This soup can be made without noodles too. In fact I usually make the noodles separate and add the noodles to each bowl and then pour the soup over it. 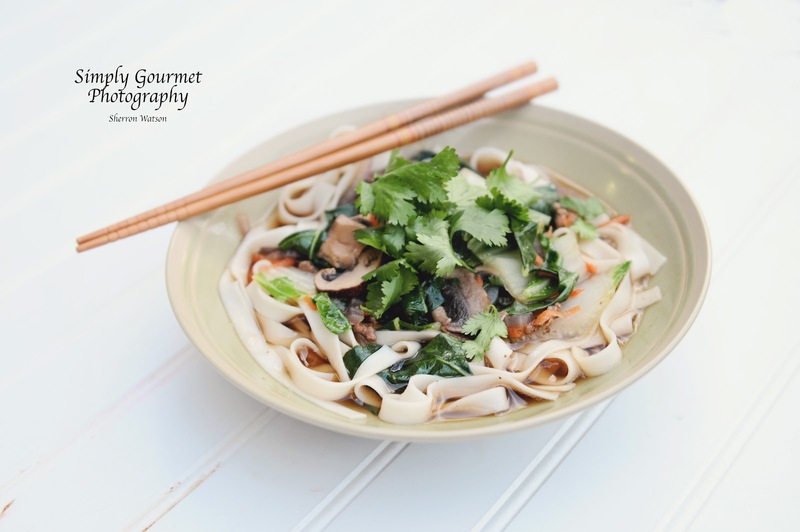 The broth is the best part, in my opinion, and so when the noodles are all gone and the veggies have been fished out…I still keep the broth and have it for a quick lunch the next day. No need to waste the tastiness of this yummy soup. The broth is what always remains the same and the veggies or meat change base on what I have on hand. You are seeing two sets of pictures from two different days of preparation. You can really customize this dish to what you and your family enjoy. 1 package of asian noodles. I use the Ho Fan (Vermicelli) These work best for us. You can use any rice noodle that your family enjoys. 2-3 cups of meat. I have used chicken, shrimp and beef in this recipe with excellent results. I usually don't mix the three meats but you could if you like that combination. 10 cups of beef broth It sounds like a lot, but our family loves this soup and we eat it for two days. 5 cups of veggies: carrots, celery, bell pepper, onion, mushrooms, garlic, or anything your family enjoys. Prepare your noodles according to the package. Read your directions for the noodles. Depending on which noodles you buy they have different preparation methods and this can mess you up if you have to let your noodles soak for 30+ minutes. In a large pot, add your broth, soy sauce and fish sauce. You will want to taste your broth to make sure the flavor is to your liking. Some like more fish sauce and soy sauce. I have given you the minimum recommended amount. Cook your meat. I have used ground hamburger, slice flank steak, grilled chicken or precooked shrimp. bok choy: I leave about 3 inches of white rib and then slice the leafs in 1 inch strips. Throw these veggies and your meat into your hot broth. Stirring occasionally to mix the things that float to the top of your pot. This should cook about 15 minutes. 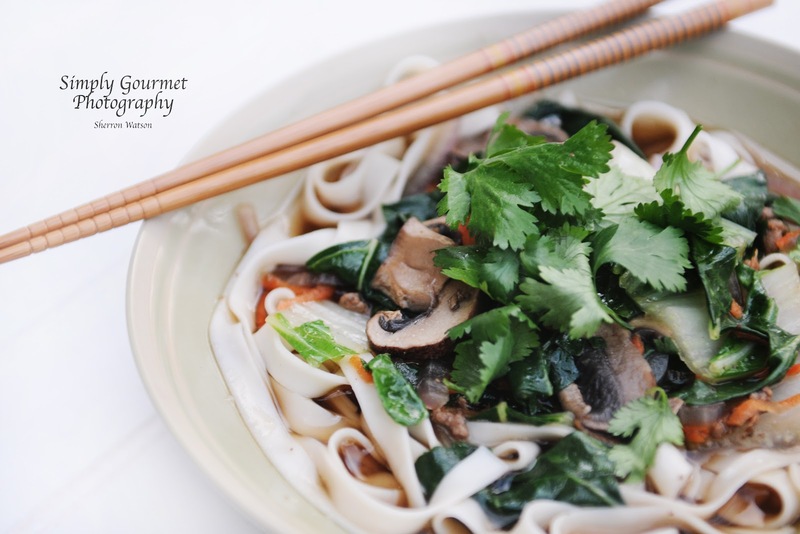 In a soup bowl, add your noodles. Top with broth and veggies. I like to serve mine with cilantro if I have it on hand….it taste amazing! Thank you ANN! 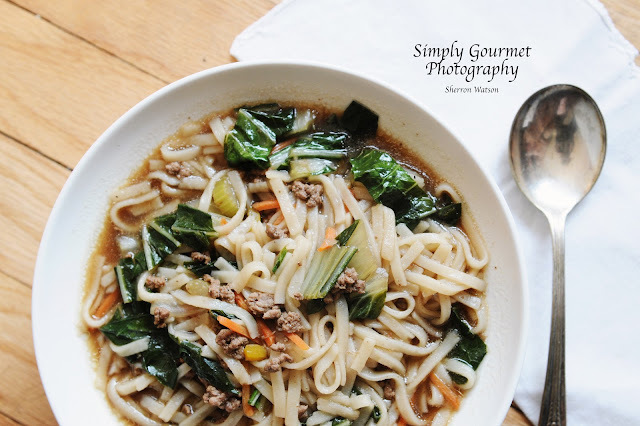 Bok Choy is amazing in most broth based soups…it not only adds color but the flavor is really tasty too. Have a fabulous day!